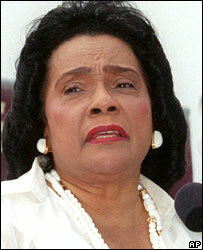 Coretta Scott King, the widow of US civil rights leader Martin Luther King, has died aged 78. Mrs King had carried on her husband's work for racial equality after he was assassinated in 1968. She fought successfully for a national holiday in memory of him and founded The King Center in Atlanta to preserve his legacy. President Bush called Mrs King a "great civil rights leader" and said he was fortunate to have known her. News of the mother of four's death was reported by former Atlanta Mayor Andrew Young to US network NBC television. Mr Young, also a civil rights campaigner, said Mrs King had died in her sleep on Monday night. Mrs King had been in poor health in recent years. She suffered a serious stroke and heart attack in 2005, and earlier this month missed the public marking of her husband's birthday for the first time in two decades. Mrs King, who met her husband in Boston and married him in 1953, supported him in his civil rights work. After his death, she raised their four children while at the same time working to secure his legacy. She recalled in her autobiography, My Life with Martin Luther King Jr, how she had felt compelled to carry on the civil rights movement. "Because his task was not finished, I felt that I must re-dedicate myself to the completion of his work," she wrote. In 1969 she founded the Martin Luther King Jr Centre for Non-violent Social Change in Atlanta and in 1986 saw the establishment of a national holiday to mark her husband's January birthday. President George Bush said in a statement that Mrs King was a "remarkable and courageous woman, and a great civil rights leader". "Mrs King's lasting contributions to freedom and equality have made America a better and more compassionate nation," he said. Send us your thoughts on the death of Coretta Scott King.